Pinnipeds include walruses, earless seals (or true seals), and eared seals (sea lions and fur seals). They are one of four groups of marine mammals, the others being cetaceans (whales, dolphins, and porpoises), sirenians (manatees and dugongs), and sea otters. The cetaceans and sirenians are completely aquatic, however, and the sea otters can mate and raise their young entirely at sea, while the pinnipeds spend considerable time on land, including giving birth and raising their young. Pinnipeds, reflecting the wide diversity in nature, exhibit diverse reproductive behaviors and occupy a wide variety of habitats, from the tropics to the polar regions. Seals are almost exclusively marine, but one species, the Baikal seal or nerpa (Phoca sibirica) lives in Lake Baikal, a freshwater environment, and two subspecies of the ringed seal also spend their whole lives in freshwater. The placement of Pinnipedia in taxonomic schemes has been a source of controversy. Some systematists regard them as a separate order based on their uniqueness as a group (Riedman 1990). Generally, however, they are placed within the order Carnivora. Carnivora is an order of placental animals that includes such familiar groups as bears, foxes, cats, hyenas, skunks, otters, raccoons, and so forth. Older classification schemes divided this order into Pinnipedia (marine carnivores) and Fissipedia (primarily land carnivores). However, pinnipeds are considered to have derived from land-based Carnivora ancestors, making this an unnatural division from the point of view of descent. Thus, the division into Pinnipedia and Fissipedia has given way to taxonomic schemes whereby pinnipeds are placed as a subdivision of Carnivora associated with or within the arctoid group ("bear-like" carnivores). Newer classification schemes divide the Carnivora into the suborders Caniformia (dog-like) and Feliformia (cat-like). Pinnipeds are placed in the Caniformia group, generally as a superfamily. Otariidae – sea lions, eared seals, and fur seals. Phocidae – true (earless) seals and walruses. One very visible difference between the otariids and the phocids is the pinna, a small furry earflap, found on the otariids. Phocids are thus referred to as "earless seals," since their ears are not easily seen, while otariids are referred to as "eared seals." Another difference is that otariids have hindflippers that can be inverted under the body, aiding their movement on land, while the hindflippers of phocids cannot be turned forward under the body, causing their movement on land to be slow and awkward (Riedman 1990). Otariids also swim using their long front flippers to move themselves through the water, while phocids swim by using their rearflippers and lower body in a side-to-side motion (Riedman 1990). The breeding system of the two groups is also different (see reproduction section below). There are 33 or 34 recognized species of pinnipeds. These include one species of odobenid (walrus), 14 otariids, and 18 or 19 phocids (one, the Caribbean monk seal, may be extinct). See classification of seals section for a detailed classification to level of species. There are an estimated 50 million pinnipeds in the world; roughly 90 percent of them are phocid seals (Riedman 1990). Among the pinnipeds, only phocids (true seals) live in the Antarctic and Arctic, while walruses inhabit the northern circumpolar waters; there are no otariids in the extreme polar regions (Riedman 1990). Only two species of phocids are found in the tropics and these are small and endangered populations, but a number of fur seals and sea lions live in tropical and subtropical areas, with fur seals ranging widely into colder climates as well (Riedman 1990). 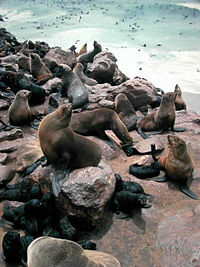 All but two species of fur seals are found in the Southern Hemisphere, while sea lions are common to both hemispheres. No pinnipeds are found in Asia (Riedman 1990). Although fewer species of pinnipeds inhabit the Antarctic than the Arctic, the Antarctic seal populations are larger (including about 30 million or so crab-eater seals); in addition, the Antarctic seals also generally have larger bodies (Riedman 1990). The larger size may be an adaptation providing more insulation or may be related to more plentiful food supply. Pinnipeds are typically sleek-bodied and rather large. Their bodies are well adapted to their aquatic habitat, in which they spend most of their lives. In place of hands, their forelimbs are large flippers (hence the name "fin-feet"), and their bodies narrow out into a tail. The smallest pinniped, the Galapagos fur seal, weighs about 30 kg (66 lb) when full-grown and is 1.2 m (4 ft) long; the largest, the male southern elephant seal, is over 4 m (13 ft) long and weighs up to 2,200 kg (4,850 lb, more than 2 tons). Pinnipeds are more streamlined, larger, and faster swimming than the sea otters, which have retained the front paws of a terrestrial carnivore, although their hind feet are flippers (Riedman 1990). Unlike sea otters, which, although they can crawl on land, essentially retain no ties to land and are able to mate and raise their offspring entirely at sea, the pinnipeds are still dependent on land and return to land to give birth and nurse their young (Riedman 1990). Otariid seals tend to have similar breeding systems, with all sea lions and fur seals being highly polygynous. Adult males are normally territorial and go without eating during the breeding season. Sexual dimorphism is pronounced among otariid seals, with males two to four times the size of females (Riedman 1990). Phocid breeding behavior is more variable, with a variety of systems and variable degrees of sexual dimorphism. Some phocids breed in solitary groups, with just the male, female, and pup, and with the male and female of equal size; others form dominance hierarchies, with larger males competing for females; and there are species where the breeding takes place in large groups with hundreds of animals. In general, male otariids defend a territory, whereas phocids with a dominance hierarchy defend clusters of females. These strategies reflect the different levels of mobility on land between otariids and phocids. As noted, the former have opposable hind flippers that can be placed flat on the ground to aid locomotion. True seals, on the other hand, cannot do this and drag themselves along using only their front flippers. Pinnipeds come ashore to breed (haul-out), and this often necessitates traveling long distances from their feeding grounds to suitable mating grounds (either on land or ice). Because of these constraints, pinnipeds tend to mate and give birth with a high level of reproductive synchrony. The most synchronous species are the two phocids (seals)—the harp and hooded seals—in which all females are estimated to become sexually receptive during a period of 10–15 days. Males in dominance hierarchies compete for females at rookeries. Females are usually highly clustered here to reduce the level of male harassment, particularly by low-ranking males. Females compete for central positions and call out if attacked by subordinate males that are subsequently chased away by the dominant bull. After giving birth, pinniped mothers suckle their young for a variable length of time. Unlike otariids, which nurse the pups for several months while alternating feeding at sea, most phocid females nurse for short periods while fasting or feeding little (Riedman 1990). Among the phocids, lactation varies from 4 to 50 days, whereas the otariids may lactate from 4 to 36 months. This reflects the fact that phocid feeding grounds tend to be a long way off-shore so lactation is associated with maternal fasting. To compensate for the short lactation period, the fat content of phocid milk is higher than in any other species of marine mammal (45–60 percent fat). After lactation, most female phocids make extensive migratory movements to feeding grounds for intensive foraging to recoup depleted energy reserves. On the other hand, otariid feeding grounds are generally closer to shore and females go on foraging trips to maintain lactation. Fat content of otariid milk is lower than that of the phocids owing to the protracted lactatory period (typically 25–50 percent). Protracted nursing also leads to the formation of social bonds. Females have a postpartum oestrus allowing them to mate soon after giving birth. Subsequent implantation of the embryo is delayed (embryonic diapause) thus removing the need to come ashore (haul-out) twice, once to give birth and again later to mate. All otariids copulate soon after birth, while most phocids mate during late lactation or after weaning their pup (Riedman 1990). Pinnipeds appear to have diverged from bear-like ancestors roughly 30 million years ago during the late Oligocene or early Miocene. Notably, the skulls of sea lions, bears, and other canids such as wolves are "nearly indistinguishable at first glance" (Riedman 1990). There are two common views of the origin of pinnipeds. One view is the pinnipeds (true seals, walruses, and eared seals) diverged from a common ancestor. Another hypothesis, the "biphyletic" view (meaning descended from separate ancestors), holds that the phocids originated independently of the other pinnipeds (Riedman 1990). In this scenario, while eared seals and walruses evolved from a bear-like or dog-like ancestor, phocid seals descended from an otter-like carnivore in the middle Miocene. Riedman (1990) concludes that the molecular evidence supports a monophyletic origin of pinnipeds (genetically both groups of pinnipeds are more like each other than other carnivores such as otters or bears), while some views on the evidence from the fossil record and comparative anatomy suggest a biphyletic origin. Furthermore, some believe the walruses diverged from the eared seals and others that walruses are more closely related to the phocids (Riedman 1990), explaining why some classifications place walruses together with the true (earless) seals in Phocidae (Tree of Life Web Project 2000). The earliest fossil pinniped that has been found is Enaliarctos, which lived 24–22 million years ago, at the boundary between the Oligocene and Miocene periods. Recent molecular analysis reveals that the closest living relatives of the pinnipeds are the bears, which was already suspected for some time (Flynn et al. 2005). This molecular study strongly supports the view that the pinnipeds are indeed monophyletic (derived from a common ancestor). Flynn, J., J. Finarelli, S. Zehr, J. Hsu, and M. Nedbal. 2005. Molecular Phylogeny of the Carnivora (Mammalia): Assessing the Impact of Increased Sampling on Resolving Enigmatic Relationships. Systematic Biology 54(2):317–337. Retrieved June 15, 2007. Myers, P., and A. Poor. 2007. Carnivora. Animal Diversity Web. Retrieved January 23, 2007. Nowak, R. M. 1999. Walker's Mammals of the World, 6th ed. Baltimore: Johns Hopkins Press. Tree of Life Web Project. 2000. Carnivora: Dogs, Cats, Bears, Raccoons, Weasels, Mongooses, Hyenas, Seals, Walruses, etc. Version 01 January 2000. Retrieved January 23, 2007. Wozencraft, W. C. 1992. Order Carnivora. In Mammal Species of the World: A Taxonomic and Geographic Reference, 2nd ed., ed. D. E. Wilson and D. M. Reeder. Washington: Smithsonian Institution Press.